The whole tent is your canvas! Printed full color on the entire canopy! 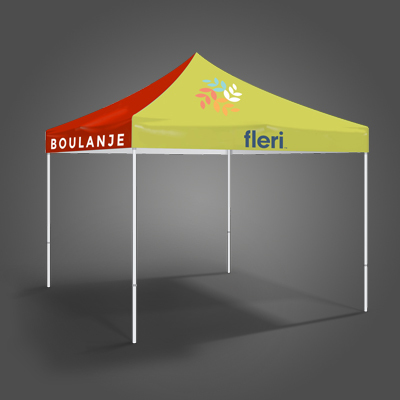 Event Tents are the perfect large-scale marketing medium to get noticed at festivals, conventions, trade shows and more. They are printed with UV Ink Technology on 11oz water-repellent fabric. They include 4 fabric panels that can feature up to 4 different designs (one for each side). Each panel is sewn together and set up on a 10’ x 10’ aluminum pop-up canopy tent. It is required that the artwork be placed on our Certified template. Contact us for the template. Comes with carrying case and FREE Shipping!